This is the desktop app we mentioned on our most recent podcast. 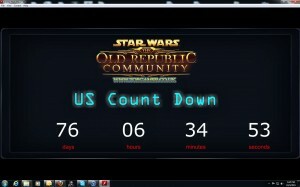 You can literally watch the seconds pass as you get closer to the Star Wars: The Old Republic release date with this desktop countdown timer from DarthAturus, posted in the torgamer.co.uk forums. You can choose from two versions, one for the U.S./North America release and one for the EU release. It pops up in an Adobe Flash window that can be sized to fill your whole screen, or scaled down to a tiny rectangle that sits quietly in the corner, a gentle, hopeful reminder of the goodness that is to come.